Breathtaking Burials: Bogus or Believable? My alarm goes off at 3 AM, and I begrudgingly roll out of bed to go dig up my great-grandfather’s corpse. I find myself tripping down the stairs; I’m not used to the dimly lit hallways because it’s not my home. It’s not even my own country. It is, however, a part of my roots: Guangdong, China, where my great-grandfather grew up. We buried him 13 years ago. In my mind, I do the math: his flesh has decayed; he’s just bones now. It’s not the prettiest picture to accompany my breakfast of red bean porridge–beans picked straight from the farm outside–but it’ll have to do. As I haul the offerings we gathered last night into a dirt bike’s flimsy basket, I begin to ponder the absurdity of what we are doing. A rickety road brings us to the base of a mountain, and we dig. Our shovels hit the coffin as reality hits me: this is just like every other “strange Chinese tradition.” The ritual of transferring the village chief’s bones to a higher ground is as commonplace as the Chinese herbal medicine my mom and I brew at home every morning–it’s no weirder than the mugwort leaves we hand-dry and burn for moxibustion. These seemingly peculiar factors of Chinese heritage are balanced between being both foreign and familiar to the critical observer: me. “You’re the Village Daughter, you do the honors,” my uncle suggests. I tenderly remove the bones from the wooden box and place them in a large ceramic vase. The bones feel hollow, and I wonder if they could have turned into something akin to petrified wood had they been buried under different soil. I feel light even as I carry the bulky vase up the mountain. The rocks are slippery from morning dew, but it’s as if ancestral spirits are securing my every step. The sky is cruising down the gradient scale–first black, then navy, and now a dusty light blue. It’s funny that before the earth became globalized, there wasn’t a universal idea of “normal.” Each village, each tribe had its own tradition. Burning fake money in a vase with the chieftain’s bones wasn’t yet questioned by “Westerners.” The perceived racial line dividing Westerners and Easterners, as we know it today, didn’t even exist. In the security of my white, suburban neighborhood, even the thought of making “authentic” dumplings at home strikes others as eccentric. In many ways, I’ve Americanized myself to the point that even I would question Chinese culture. 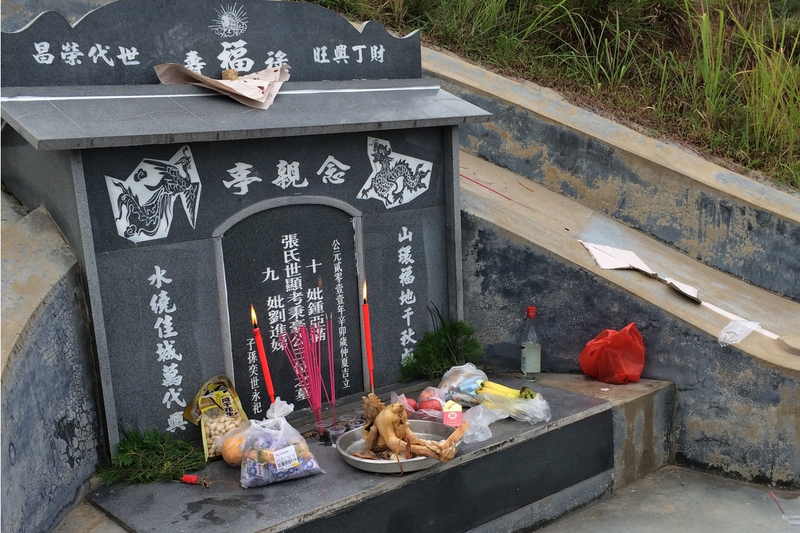 Did the villagers really believe that my great-grandfather’s spirit commanded them to rebury his bones? Would he actually see his new grave, a stone monument honoring his leadership? Are dumplings weird? Modern science dismisses religion and foreign worship traditions; if it’s not proven and backed by at least three run-throughs of The Scientific Method, it’s fake. Spirits can’t possibly exist because technology hasn’t detected them yet–unless we record the density of air where the ghost of my great-grandfather theoretically stood. I’ve been brainwashed to fit either end of the ideology spectrum rather than find an equilibrium; only through my multiple ventures to my parents’ homeland have I begun to chip away at these Western lenses. Standing on this mountaintop, overlooking the village my family ruled and the farms that roll out like parchment, something stirs in my stomach. It might be incense smoke mixed with fragrant vodka offerings, creating an aroma that would immediately be categorized as “sketchy” back home. Or, it might be my great-grandfather’s spirit, scientifically proven by none but faithfully believed in by me.